MGF Houdini's Top Hat is a 30" black wooley. He has great color and very good conformation. (Pics on Website) But most important, he is so gentle and sweet. He's great with moms, babies and very well mannered. Topper is only 3 years old so his babies are just arriving!! So far 3 little girls! 2 jet black and 1 tiny light gray. All under 20" at birth. They have nice straight legs, good conformation, and gorgeous little heads. We are very pleased. Sorry, all of our 09 babies are enjoying their new homes. Even the three 2010 little girls are sold. WE have 25 more to foal this year. So I am sure we can find just what you are looking for. Give us a call or check out our website. A deposit will hold until weaning. 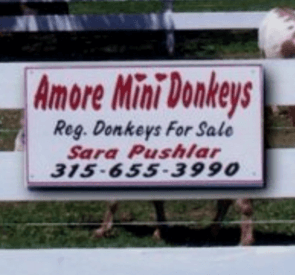 We offer a buy back guarantee, that way we know our donkeys and new owners are happy.